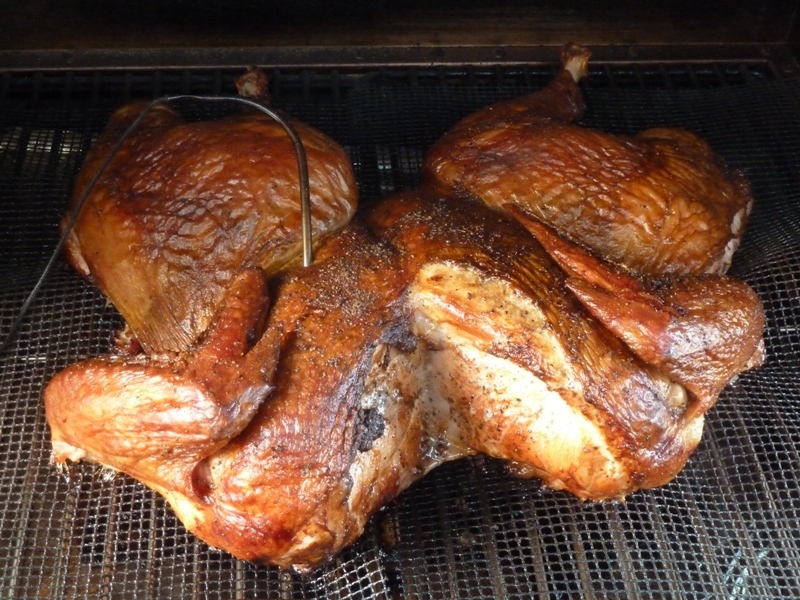 Apple Smoked Spatchcock Turkey in a MAK 2 Star Wood Pellet BBQ Smoker-Grill tastes spectacular! This is not the turkey you grew up with that was stuffed with your Mother's famous dressing handed down for generations and roasted in the oven at 325ºF for the better part of the day. No, this is better!! "Spatchcock", the process of removing the backbone and flattening the turkey, is also known as butterflying. For chickens and Cornish Hens using poultry shears to remove the backbone works great but for a turkey I prefer to use a large butcher knife to remove the backbone. 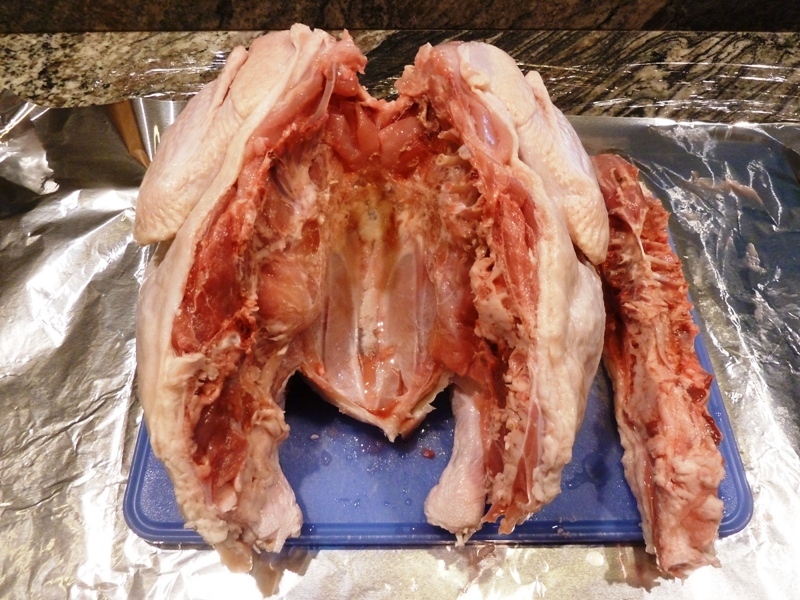 You may need to split the breastbone in order to properly flatten the turkey. Trim the 16 pound spatchcoked turkey of excess fat and skin. Rub the turkey On & Under the skin (breast, leg, and thigh) with Extra Virgin Olive Oil and season with a liberal amount of Lucille's Bloody Mary Mix. 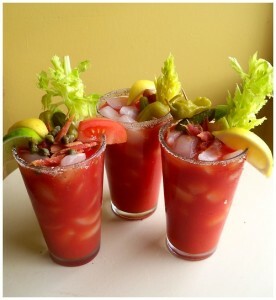 Depending on your preference use Lucille's San Francisco Mild, New Orleans Nippy, or Cajun Hot. Lucille's dry herbs and spices produces an exceptional flavor profile on a variety of proteins and makes an authentic 1940s style Bloody Mary every time - and who doesn't enjoy a perfect Bloody Mary? Preheat the MAK 2 Star pellet smoker-grill to 180ºF (smoke setting) and gently Apple smoke the 16 lb spatchcocked turkey for 2½ hours skin side up. 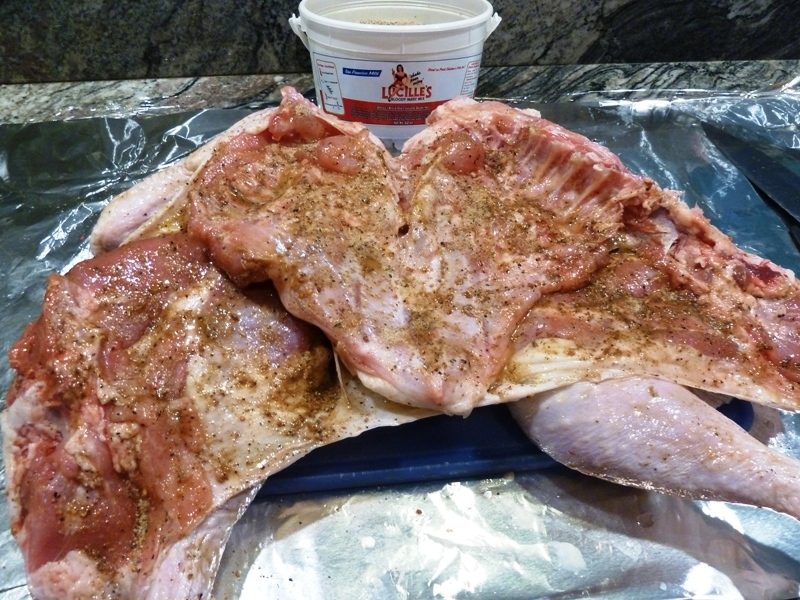 Increase the pit temperature to 325ºF until the internal temperature of the breast at the thickest part reaches 170ºF. 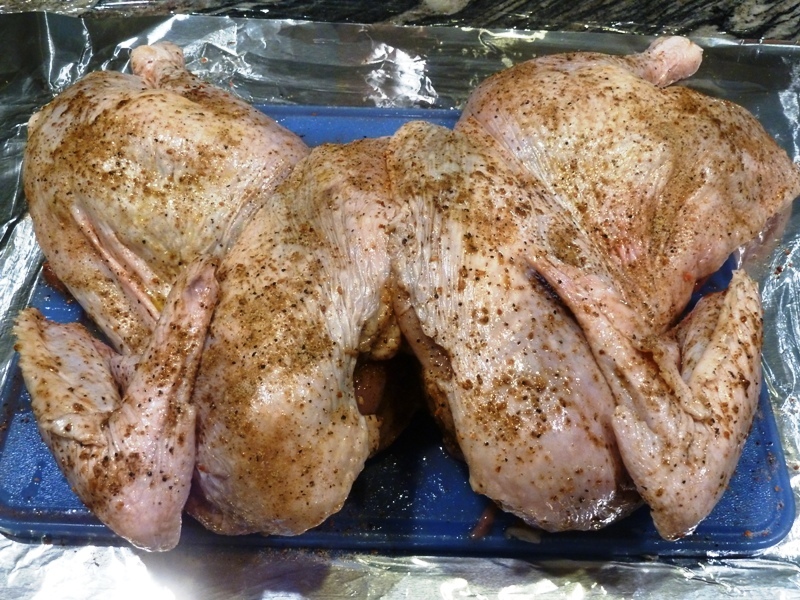 At this point, the legs and thighs should be at 180ºF or higher. 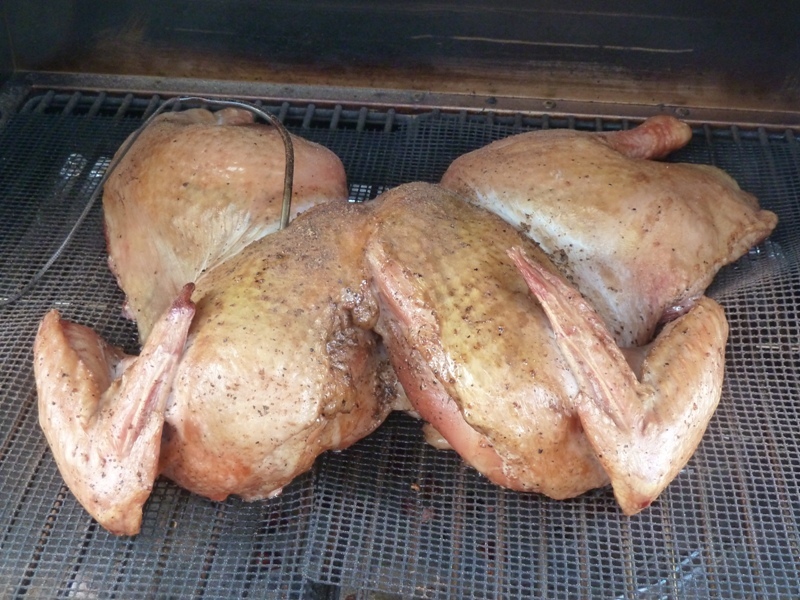 The spatchcocked turkey, which has more surface available for even browning will provide a nice crackly, crispy skin. Perhaps best of all, the 16 pounder will cook much quicker than an old fashioned roast in the oven. 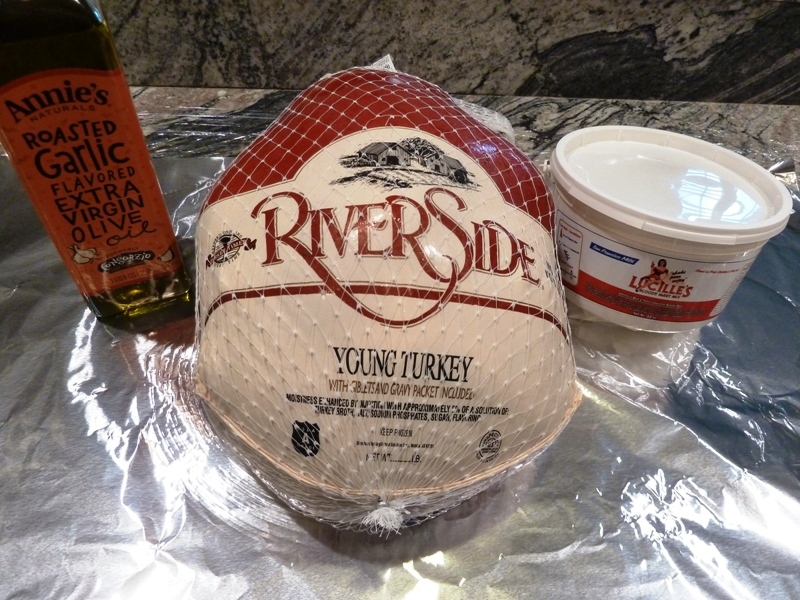 Allow the turkey to rest under a foil tent for 20 minutes before carving and serving. Remember that cooking times should only be used for estimates - always rely on the internal temperature of your meat, poultry, or seafood. 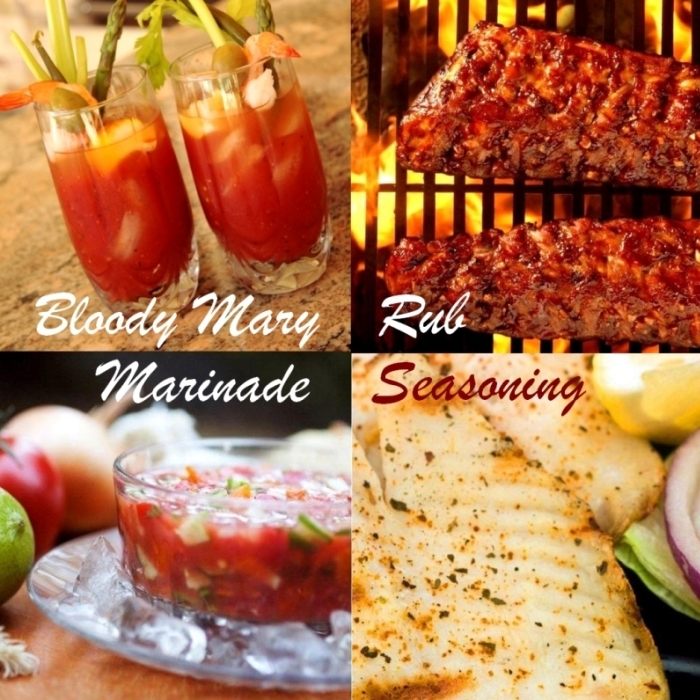 From start to finish it took 4½ hours ... smoked for 2½ hours at 180ºF and 2 hours at 325ºF. Your times may vary. Be sure to add time for preheating and resting. I used a MAK 2 Start Wood Pellet BBQ Smoker-Grill but this scrumptious recipe will work with any pellet grill, like a Traeger, Green Mountain, or any of the multitude of great smoker-grills on the market. As long as you can set and maintain temperatures. You can use your favorite charcoal, gas, or electric grill too.